The eastbound Southwest Chief at the Hilton Road Crossing west of La Plata on 1/4/2010. The eastbound Southwest Chief with the Chris Guenzler Million Mile Lookout Point in the view from the Brown Street Bridge in La Plata on 1/4/2010. The eastbound Southwest Chief at Santa Fe Lake on 1/4/2010. The eastbound Southwest Chief at the old wooden bridge west of Gibbs, Missouri on 1/5/2010. The Coast Starlight changes crew at Klamath Falls on 2/4/2010. Cascade Talgo 510 came into Edmonds on 2/7/2010. San Joaquin 717 north of Laton on 3/14/2010. Amtrak takes you through all conditions of weather as seen by the baggage car of the Southwest Chief on 3/21/2010. 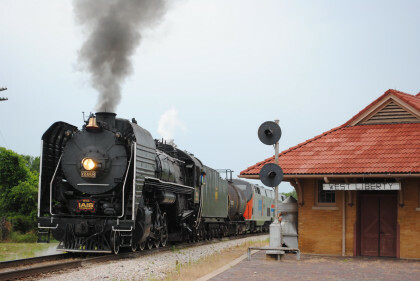 The Missouri River Runner Train 311 comes into Sedalia, MO. on 4/23/2010. 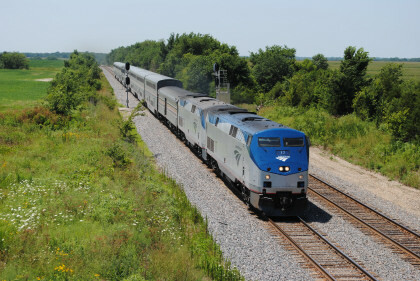 The Southwest Chief at Argyle, Iowa on 5/13/2010. The Lake Shore Limited waiting at Chicago to leave for New York City on 5/13/2010. Amtrak Train 64 the Maple Leaf from Toronto passing through Amsterdam on its way to New York on 5/17/2010. Train 43 the Pennsylvanian to arrive at Greensburg, PA. on 5/22/2010. 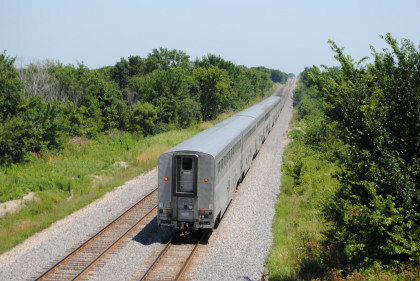 The California Zephyr at Ottumwa, IA. on 5/23/2010. Empire Service 235 came into the Albany-Rensselaer Station on 6/16/2010. 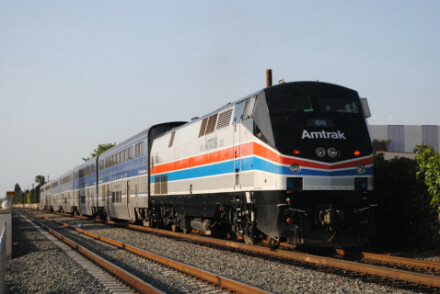 Amtrak 653 on a northbound train at Trenton on 6/18/2010. Acela Express 2164 to Boston at Wilmington, DE. on 6/30/2010. Acela Express 2117 to Washington DC came and went at Wilmington on 6/30/2010. 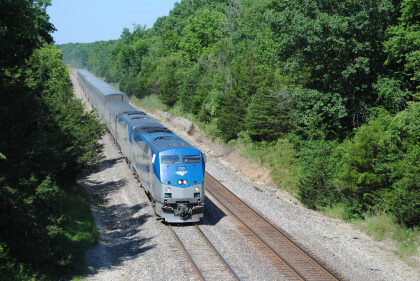 I boarded Acela Regional 125 at Wilmington on 6/30/2010. Amtrak Missouri River Runner 311 came into Kansas City on 9/30/2010. 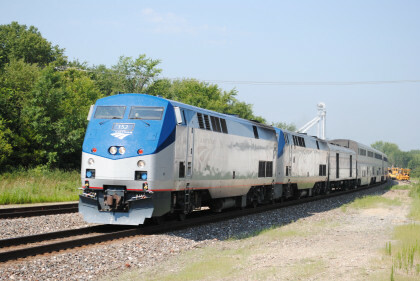 The Texas Eagle seen at St Louis on 10/1/2010 before detouring over the Old CE&I where it went by the Beecher Station during its trip. 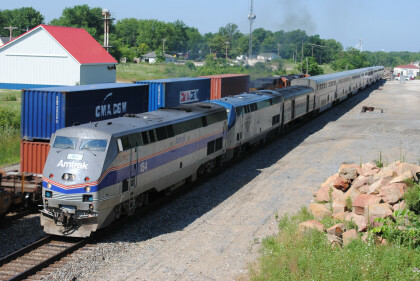 The Southwest Chief at La Plata on 10/5/2010. 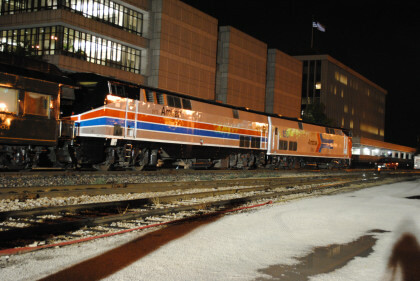 The Southwest Chief Train 4 at La Plata on 12/29/2010. 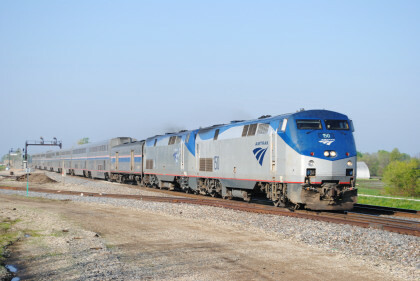 The Southwest Chief Train 4 at the La Plata crossovers on 1/3/2011. 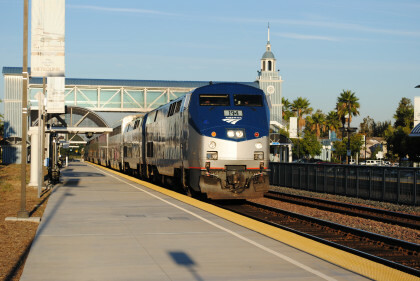 The Pacific Surfliner Express Train 563 started running on 2/15/2011 and here is the first run at Oceanside. 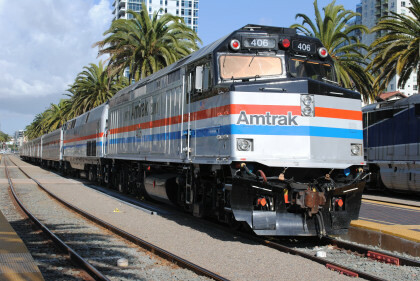 This train only stops after leaving San Diego at Solana Beach, Oceanside, Irvine and Anaheim before arriving into Los Angeles. 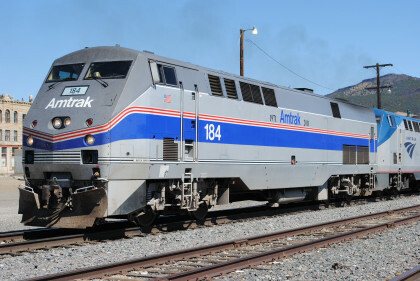 Amtrak 145 in its 40th Anniversary Paint Scheme came into LAUPT on the point of the Sunset Limited on 2/20/2011. 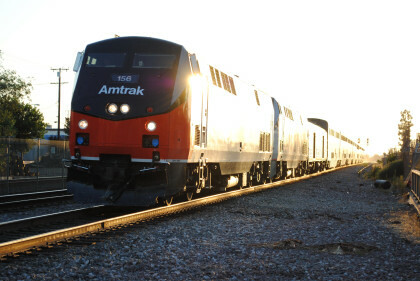 The Sunset Limited headed to the Amtrak 8th Street Coach Yard for servicing on 2/20/2011. Surfliner 567 arrived into Santa Ana on the last day of 2/28/2011. The PRS 75 Year Excursion Tehachapi and Palmdale Cutoff Trip ran on 4/2/2011. 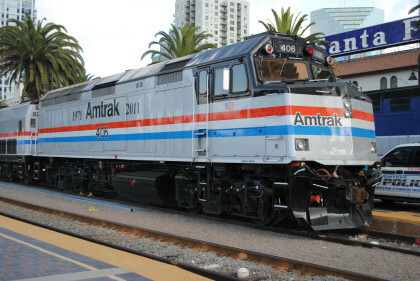 Amtrak 165 at rest in Los Angeles after that trip on 4/3/2011. Coast Starlight detoured over Altamont Pass and the Tehachapi Loop on 4/8/2011. Empire Service Train 281 at Utica on 5/17/2011. Amtrak 715 at Utica, NY on 5/17/2011. 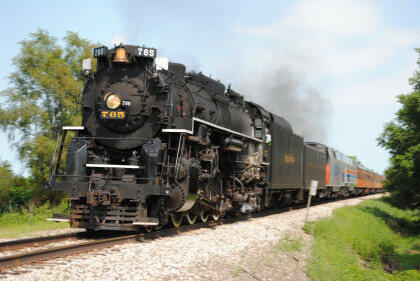 The Lakeshore Limited 49/449 arriving into Utica on 5/18/2011 over 8 hours late. Empire Service Train 280 at Utica on 5/18/2011. Missouri River Runner 316 waits in Kansas City for its afternoon departure to St Louis on 5/30/2011. Missouri River Runner 313 comes into Jefferson City on 5/31/2011. The Northern California Explorer dropped to the Pitt River on 6/3/2011. Empire Builder 27 crosses the fill at Horsethief Lake running 5 hours late on 6/20/2011. SP 4449 pulled the NRHS Special from Portland to Tacoma on 6/21/2011. The Empire Builder 7 running ten hours late through Mukilteo, Washington with Amtrak 156 on the point on 6/22/2011. Cascade Talgo 516 came next through Mukilteo on 6/22/2011. 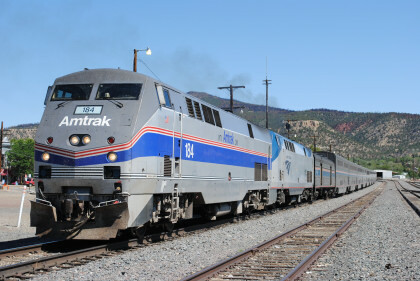 The Empire Builder 8 came out of the Cascade Tunnel on 6/23/2011. Empire Builder 7 running through Edmonds with Amtrak 156 on the point on 6/23/2011. Southern Pacific 4449 leads the NRHS Stampede Pass Trip from Tacoma to Easton on 6/25/2011. The NRHS Southern Pacific 4449 leads the Tacoma to Portland Trip on 2/26/2011. Surfliner 578 pulled into San Juan Capistrano on 7/5/2011. Amtrak 66 in its Heritage 2 Paint Scheme is on the point of the Sunset Limited on 7/6/2011. 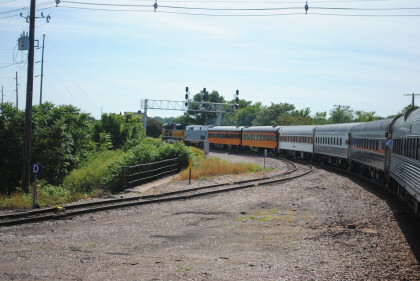 The Southwest Chief Train 4 arrived into La Plata on 7/17/2011. 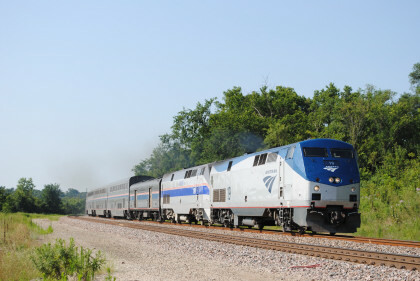 The Southwest Chief Train 4 with Amtrak Heritage Unit 181 at the Missouri Z grade crossing on 7/18/2011. 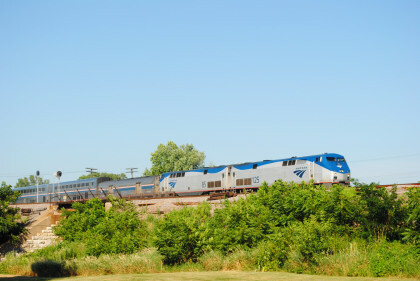 Amtrak's Southwest Chief Train 4 at Sycamore Lane on 7/19/2011. 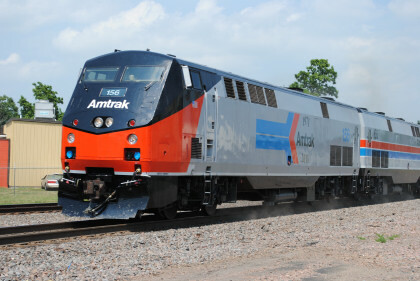 Amtrak's Southwest Chief Train 4 was running right on time at Argyle on 7/20/2011. 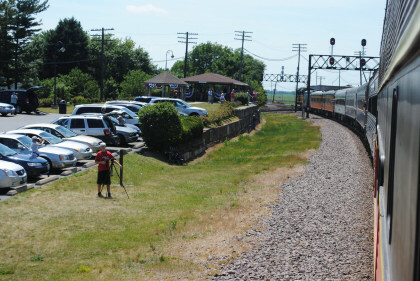 Amtrak's California Zephyr came into Galesburg on 7/20/2011. 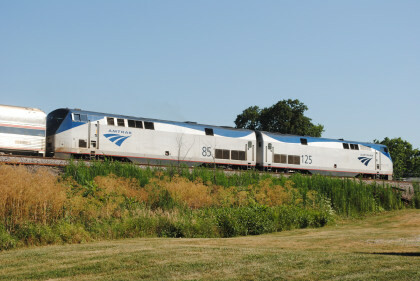 The Amtrak Rock Island Special pulled into Galesburg on 7/21/2011. The Amtrak Rock Island Special at rest at Rock Island at Train Festival 2011 on the night of 7/21/2011. The Amtrak Heritage Units ran with the Nickel Plate 765 on the Train Festival 2011 Trip from Rock Island to Bureau on 7/22/2011. The Amtrak Heritage Units ran with the Iowa Interstate QJ 6988 on the Train Festival 2011 Iowa City Steam Trip on 7/23/2011. 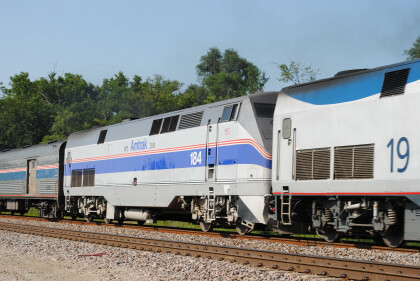 The Southwest Chief Train 4 with Amtrak Heritage Unit 184 leaves La Plata on 7/26/2011. 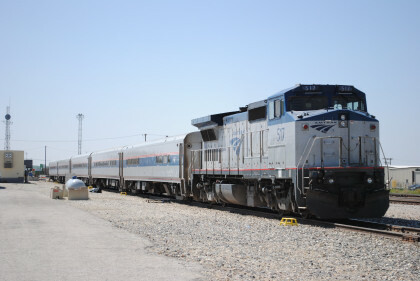 The Southwest Chief Train 3 with Amtrak Heritage Unit 184 at Raton, NM on 7/28/2011. The Southwest Chief Train 4 with Amtrak Heritage Unit 156 at Fullerton, Ca on 8/24/2011. 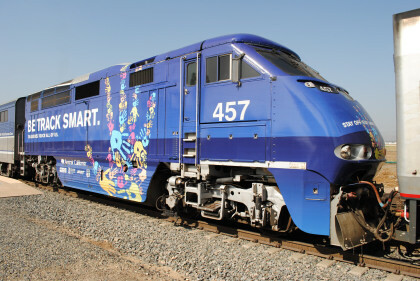 The new Operation Lifesaver Unit 457 on the Pacific Surfliner Route at Irvine on 9/25/2011. The Martina McBride Special Train at Buena Park on 10/10/2011. 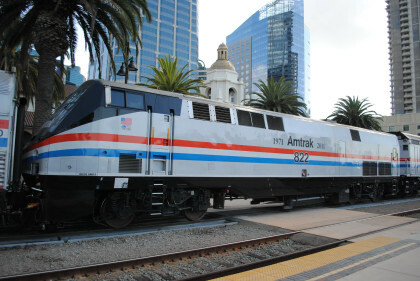 The 40th Anniversary Amtrak Train was in San Diego on 12/3/2011. Amtrak NPCU 406 the former F-40PH is on the train on 12/3/2011. Amtrak P40 822 provides the motive power for the train on 12/3/2011. 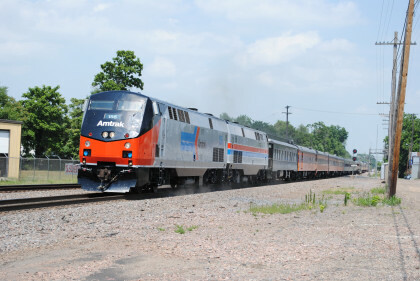 The eastbound Southwest Chief headed through Mendon on 4/2/2012. 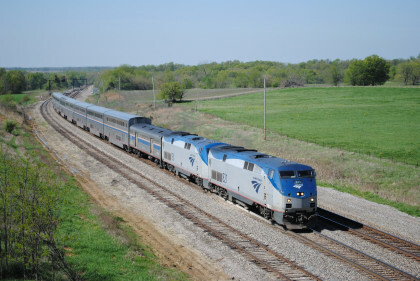 The Southwest Chief at West Baring on 4/6/2012. 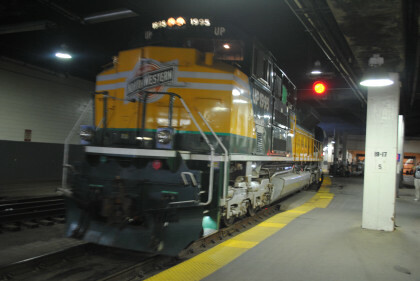 The Carl Sandburg 381 at West Quincy on 4/6/2012. Amtrak 66 on Surfliner 785 at 17th Street in Santa Ana on 5/6/2012 making the engine first northbound run on a Pacific Surfliner Train. 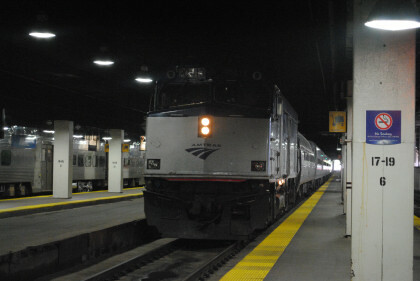 A Hiawatha Service train arrived into Chicago Union Station and then boarded and departed again to Milwaukee on 6/17/2012. 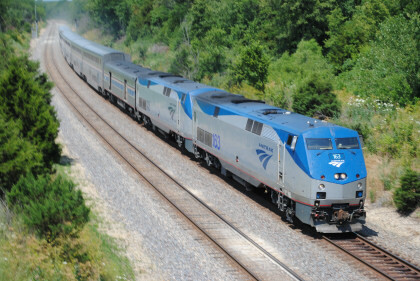 The NRHS 2012 Convention Train that took us to Cedar Rapids, Iowa for all the mainline trips we did out of that city during the convention. 6/17/2012. The eastbound Southwest Chief went under the old bridge just west of Medill on 6/27/2012. 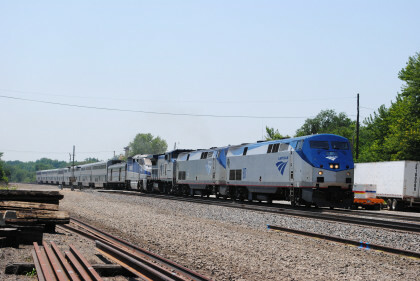 The eastbound Southwest Chief came into La Plata on 6/28/2012. 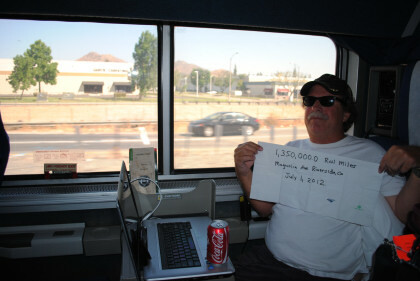 I passed my 1,350,000.0 Rail Mile as the Southwest Chief crossed Magnolia Avenue in Riverside, Ca on 7/1/2012. Surfliner 583 had the Cascade Cabbage Car leading and Amtrak Heritage Unit 184 pushing at the 17th Street Crossing in my hometown of Santa Ana on 9/24/2012.